One of the best parts of staying at a Disney World resort is the ability to get your boarding pass and check your bags at the resort for the return flight home, saving you lots of time and luggage transfer hassle. Anybody can use it - you do not have to be using Magical Express. The resort airline desks are usually located in the lobby or entrance area of Disney World resorts and are open from 5 a.m. to noon only. If your flight is before 8 a.m., you will not be able to check your bags but can take your luggage with you to check at the airport. You must check in at least 3 hours before your flight departure, but can't check in for your flight more than 12 hours in advance. It is appropriate to tip the people handling your luggage here because it is similar to curbside check in at the airport. All resort guests flying on one of the following airlines (including international guests) can get boarding passes for their flight at their resort and check their bags as well. This is not limited to only people using Magical Express. If you're flying an airline that requires you to pay for checked bags, you will need to do that at the Resort Airline Check-In desk. Oversized bags (usually anything over 50 pounds) are not allowed here and will have to be checked at the airport. People who are flying on airlines that are not listed above cannot take advantage of this service, but can still use Magical Express. You would just need to bring your own luggage when you get on the bus, and then get your boarding pass and check bags at the airport. Planning to go to a park or have a meal before heading to the airport? Here's a suggestion for how to plan your departure day. Head to the airport. With your bags already checked, your airport time will be much easier. Have any questions or comments about Resort Airline Check-In? Please share in the comments. Has anyone used this recently and been successful using TSA pre-check? You point out that boarding passes printed at the front desk are usually rejected by TSA. Our passes printed at the resort check-in desk at POR were also rejected by TSA last year. What if you’re staying at the Dolphin or Swan or a Disney Springs Hotel? Can you go to the nearest Disney resort and check your luggage and get your ticket? We have enjoyed using Resort Airline Check-in but on our most recent trip the boarding pass printer at Pop was apparently running low on toner/ink. At the airport, my boarding pass scanned ok (after several attempts) but my husband’s and daughter’s were too faint to read so they had to find the SWA desk and have them reprinted. So check that your boarding pass is printed clearly. Can I just pay for my checked bags with resort airline check-in if I have already checked in online from my phone/laptop? Or do I need to do the whole process with them (Check-in, pay for bags, give them bags). Thanks! Is this option available at the Dolphin Resort? Im staying on site at WDW in December. Will I be able to use the Resort Check In if my luggage exceeds 50 lbs. Note: I am flying on United First Class which allows up to 70 lb maximum. Also, my return trip departure time at MCO is 9 AM. What time would I need to leave the resort on the Magical Express. Thanking you in advance for the assistance. My flight is at 8:30pm on Southwest. Can I still check-in my bags in the morning on the day that I leave and use Magical Express later that evening? Yep, you can definitely do that. What I usually do is take my checked bags to the check-in desk in the morning, then take any carryon bags that I don’t want to carry in the parks to bell services, go to the parks, pick up carryon bag at bell services, board Magical Express bus. Hope that helps. Have a great trip! Just used this service on Saturday. No problem using the boarding passes at MCO. 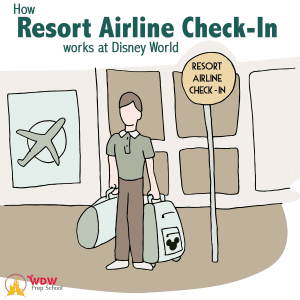 We used resort airline check-in when leaving the Polynesian in July. Upon arriving at TSA at the airport they pointed out to us that our boarding passes were marked pre-screened. They then told us we had to go to the pre-screened lines. At the counter there our boarding passes did not work as pre-screened. They informed us that Disney boarding passes “never work” as pre-screened even when marked as such. They then sent us back to the regular TSA lines. Upon arriving there they pointed out our pre-screened and wanted to send us back to pre-screened. Not the most enjoyable end to our Disney vacation. Something needs to be done! For UK guests on a Virgin Holidays package, although not eligible for resort check-in, a similar scheme operates at Downtown Disney for checking in there on the morning of the flight home which leaves you free to enjoy the parks on your last day.